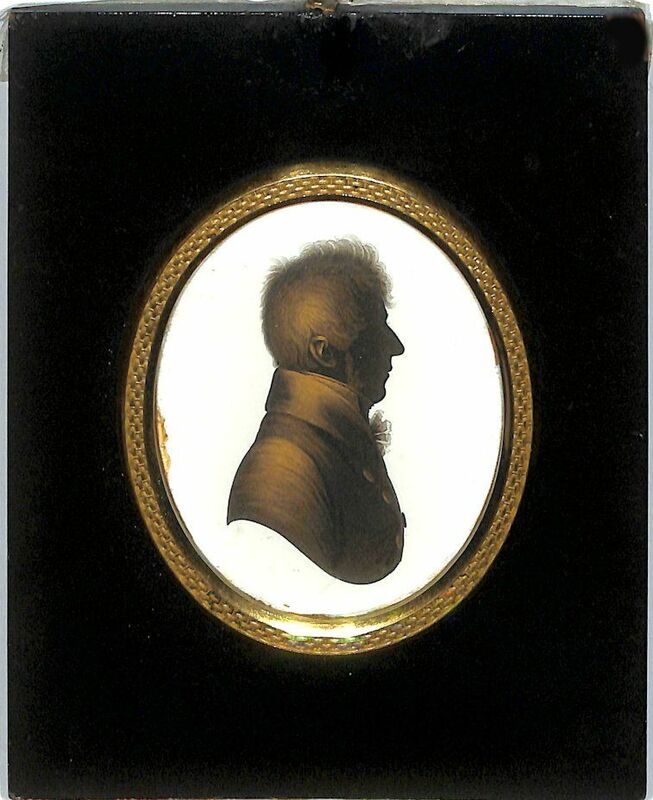 Every good collection of silhouettes needs to include profiles by John Field who is well acknowledged as ranking amongst the finest silhouette artists of the period and was a master of the art of gilding. This fine example of Field’s work portrays a gentleman named by an inscription on the reverse as ‘Captain Bodmin / friend of Mr Henry Hope’. 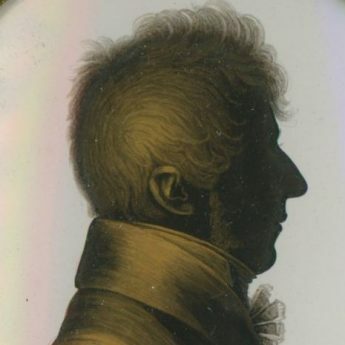 The detail of his double-breasted coat worn over a frilled chemise and stock has been expertly captured as too are his bushy sideburns and his hair that is brushed over his face with flyaway curls over his forehead. Painted on plaster and set in the original papier-mâché frame with a decorative surround, the profile is backed with a partial trade label no. 12. 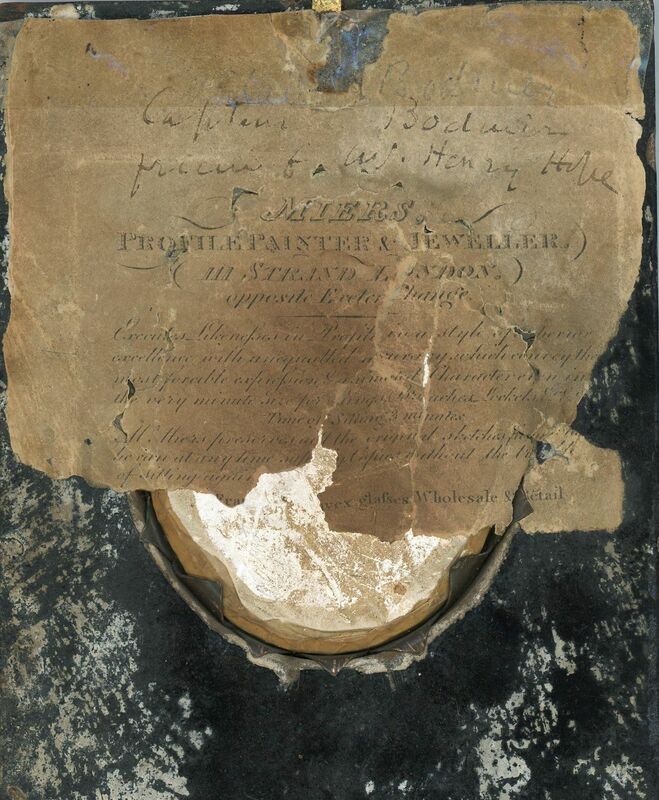 This label was in use between 1810 and 1821, the period when Field is acknowledged to have produced his finest work. There is some old gum visible on the left edge (just below nine o’clock). The frame is chipped on the top right corner and has lost the front part of the hanger though the ring itself remains secure. 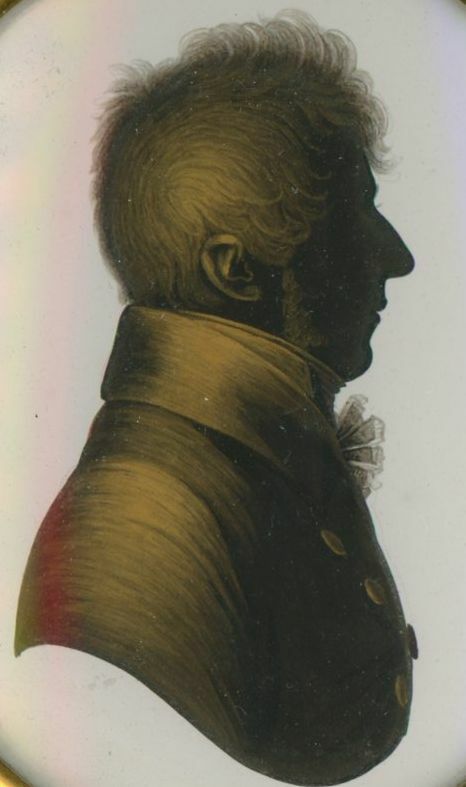 John Field (1772-1848) began his career as an assistant to John Miers during the 1790s. Theirs was a long and prolific partnership lasting until the death of Miers in 1821 when the business was jointly willed to Field and Miers’s son, William. 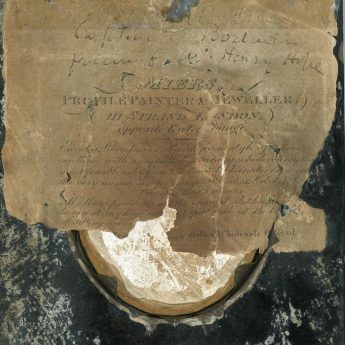 Sadly, before the decade was out, the joint business was declared bankrupt though Field continued to paint profiles during the 1830s but now he was sharing a studio with his own son.